Armchair Book Expo Headquarters: Kicking Off Armchair BEA Giveaways: Two BEA Bloggers Passes! Kicking Off Armchair BEA Giveaways: Two BEA Bloggers Passes! One of the most exciting aspects of our recently announced partnership with Book Expo America and the BEA Bloggers Conference is that we have the opportunity to provide Armchair BEA participants with a few exclusive giveaways. This is certainly one to get excited about! Book Expo America and the BEA Bloggers Conference are offering two (2) individual BEA Bloggers Passes which also includes access to BEA as well to Armchair BEA participants! Thank you!!! Closing Speaker Jenny Lawson "The Bloggess"
We'd encourage everyone to take a look at the BEA Bloggers Conference Agenda for more details about the amazing event they have planned! Also, be sure to follow their Facebook and Twitter pages for up-to-date details and news about the BEA Bloggers Conference and Book Expo America. This giveaway is specifically for two individual BEA Bloggers Passes which also includes access to BEA as well. There is NO travel or any other compensation related to attending the conference, so this will most likely be best for those living near the actual conference. There are only two stipulations, due to registration technicalities, you cannot already be a registered for Book Expo America and you must be a book blogger. This giveaway is for a book blogger that has not already registered! 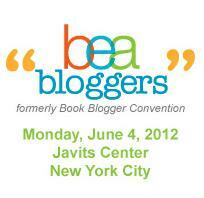 Enter for a chance at one(1) of two(2) free BEA Blogger Passes by completing the form below. The contest will run only until Tuesday, May 29, 2012 ending at 11:59 p.m. CST. Only open to entrants not already registered for BEA and must also be book bloggers. The winner will be chosen using random.org and announced here on the site on Wednesday, May 30th after the winners have confirmed via email their acceptance of the winning BEA Blogger Passes. No purchase is necessary to enter this giveaway and only one entry per person please. Again, thank you to Book Expo America and the BEA Bloggers Conference for this wonderful giveaway! This isn't the last we have to tell you about thanks to this partnership and we hope you'll be excited about what's still to come as well, we know we are! This giveaway is now closed. Stay tuned for details about the winner as well as more from Armchair BEA! what an amazing giveaway! thank you for hosting and thank you BEA & BBC for the incredible giveaway! crossing my fingers twice!!!! Yay! Love Armchair BEA. Thanks so much for the incredible giveaway! Question: Do you need to be 18 to enter this? Or does the Book Blogger pass have different age rules than the other parts of BEA?